Regina Papachlimitzou is the Activity Team Support Officer for Britain from Above. The project is a four year Heritage Lottery Fund supported project run by English Heritage and the Royal Commissions on the Ancient and Historic Monuments of Scotland and Wales, and involves the conservation, digitisation and cataloguing of 95,000 negatives from the Aerofilms collection. Click on images for a larger view – the original (even larger) images can be seen on the Britain from Above website. Stranded in the water a few hundred yards from Brighton’s seafront, what remains of West Pier stands silent watch over the buzzing city; a doleful cage bereft of birdsong. But West Pier hasn’t always been eerie and pitiable. It seems only a blink of an eye since the below Aerofilms image was taken. 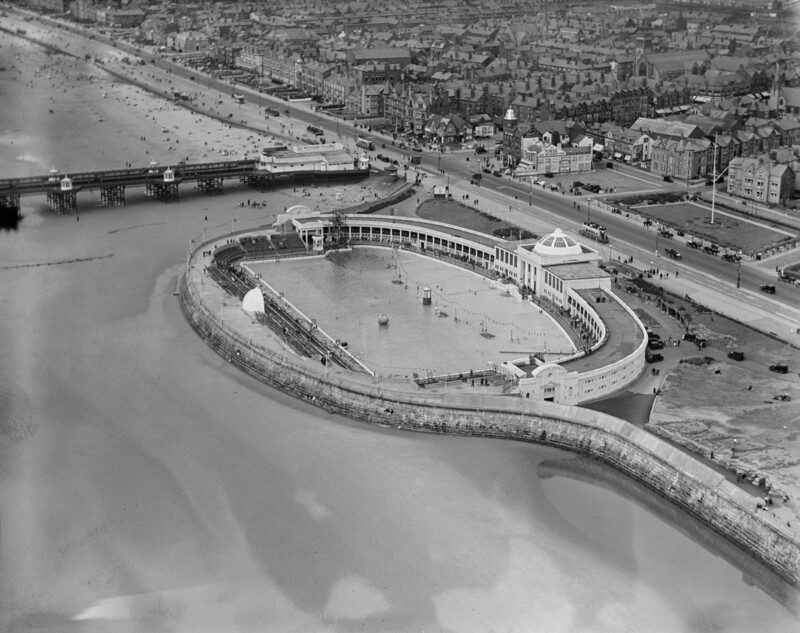 Approximately 1 in every 60 of the 41,000 Aerofilms images currently online includes a pier. And why should this surprise us? 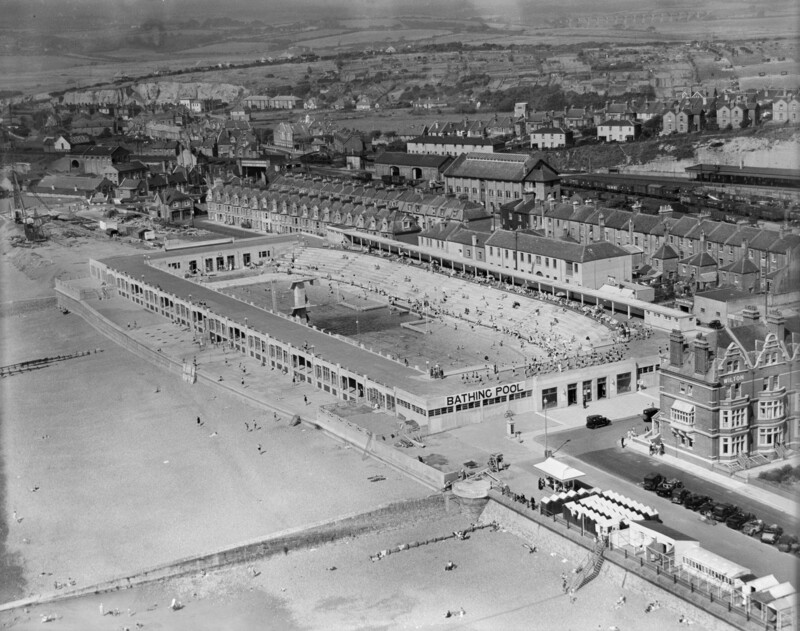 From the turn of the century to the 1920s and beyond, the appetite for sea air and glittering, out-of-the-ordinary entertainment created the fertile soil in which the seeds of the cult of the English seaside resort were sown. The people wanted piers. On a pier, people could feel they had somehow mastered the water, while still getting the frisson of spying the sea below through the wooden boards. They could escape the drabness of everyday life on land but remain moored to its safety. 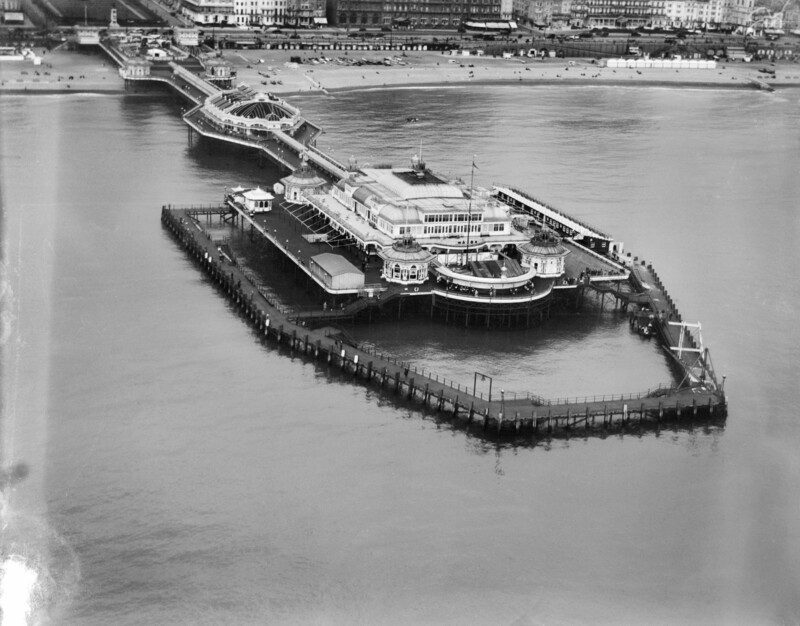 The images in the Aerofilms collection range from modest, simple piers (such as New Ferry Pier) to the grandest, most consummate affairs like Eastbourne Pier or the ‘peerless pier’ of Hastings. 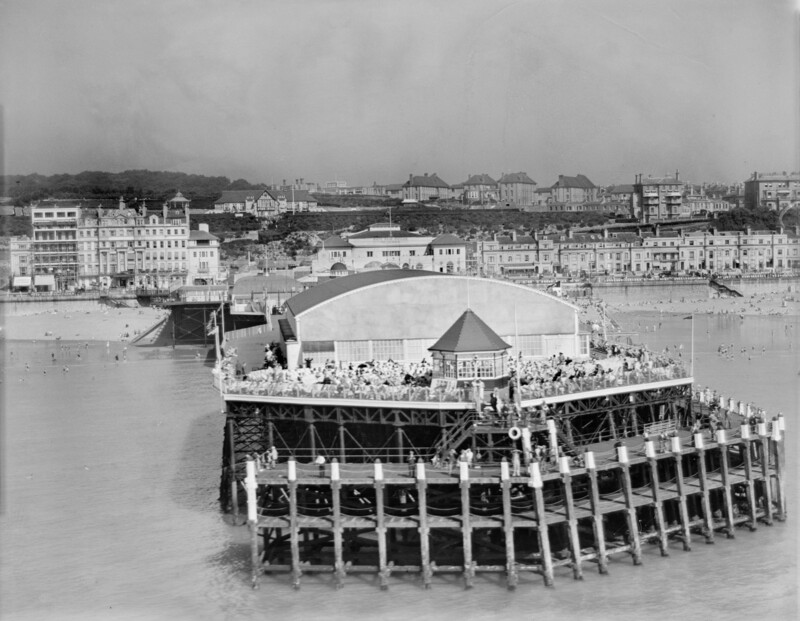 Hastings Pier, which met a similar fate to West Pier, was an elegantly capacious structure encapsulating multiple desirable facets of seaside entertainment: pavilion, entertainment hall, theatre, large bandstand. 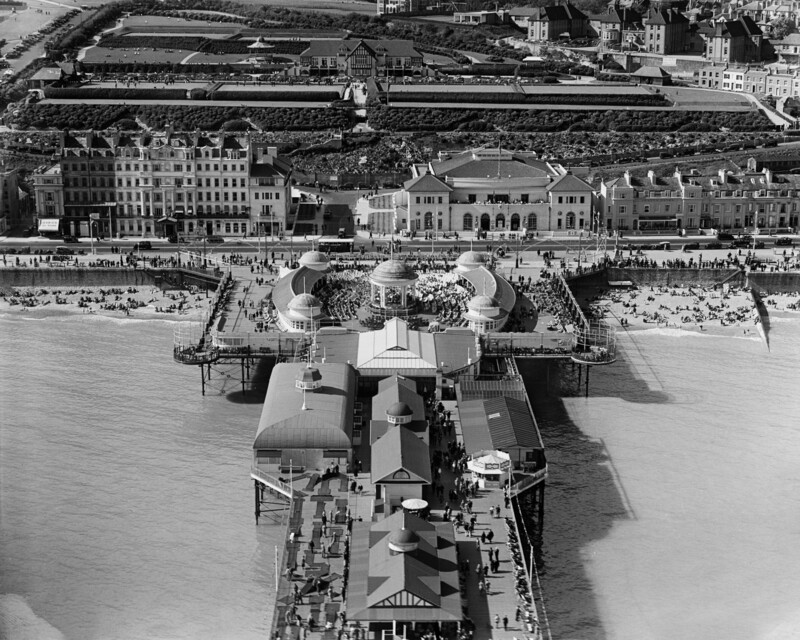 Fashionable and refined, Hastings Pier attracted not a stream but a torrent of visitors, as documented in the Aerofilms images of it. Holidaymakers crowd the pier head and spill over to the lower deck, clustering in the coveted spaces along the edge. They contemplate the water, or amuse themselves with the spectacle of nearby bathers. As the 20s melt into the 30s, a new kind of structure comes into view, the epitome of early 20th century seaside leisure: the lido. No longer satisfied with walking on water, people now want to immerse themselves in it and reap its alleged health benefits. And this they did while enjoying the safety, comfort, and indisputable beauty of the Art Deco and Modernist structures, many of which were built right on the seashore. Some magnificent examples of lido architecture feature in the Aerofilms collection. 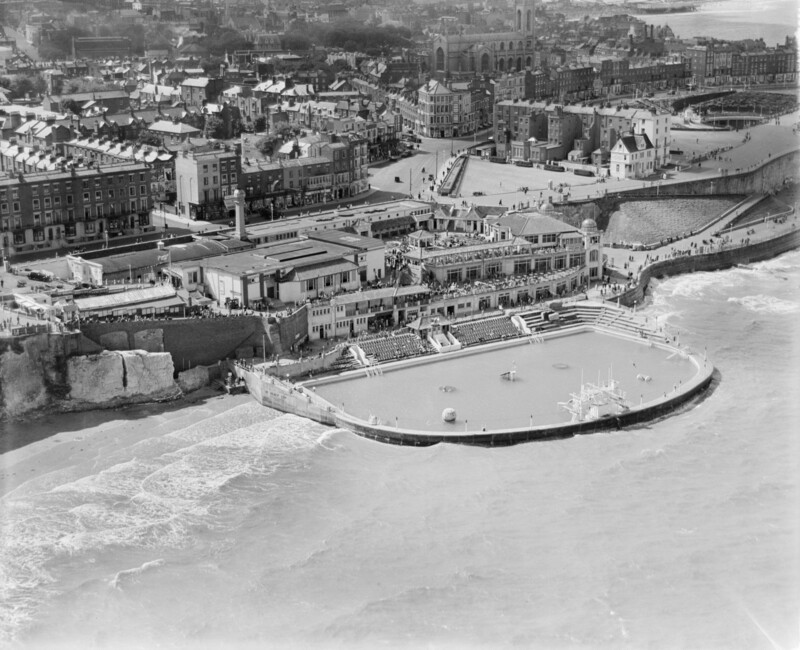 The delightful Margate lido, joyfully defiant in the face of sea waves breaking around it; the stylish, oval-shaped lido next to Blackpool South Pier; the monumental St Leonard’s lido, with its myriad of happy bathers (including one who looks like he’s trying to convince himself to dive off the dizzyingly high diving board). 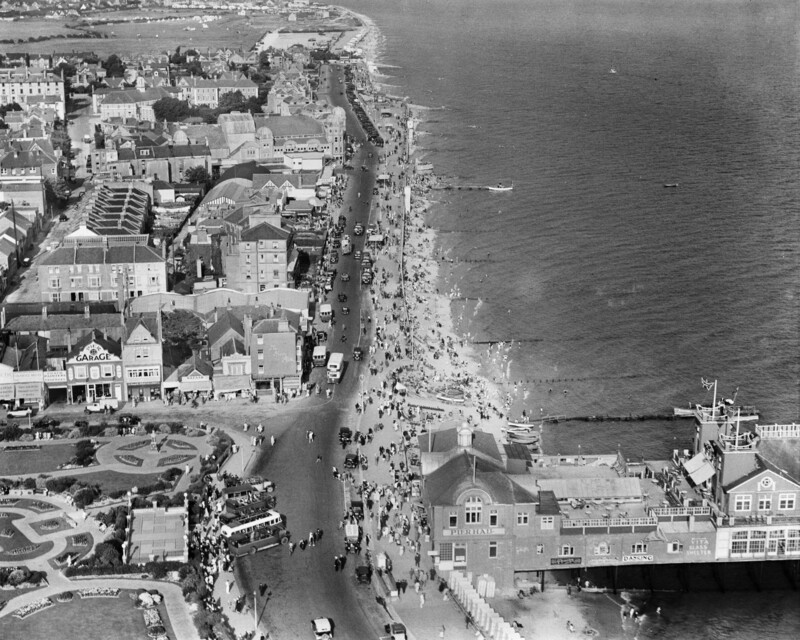 Perhaps more so than any other kind of Aerofilms image, the images of seaside resorts bring us close to the people whose world the collection documents. 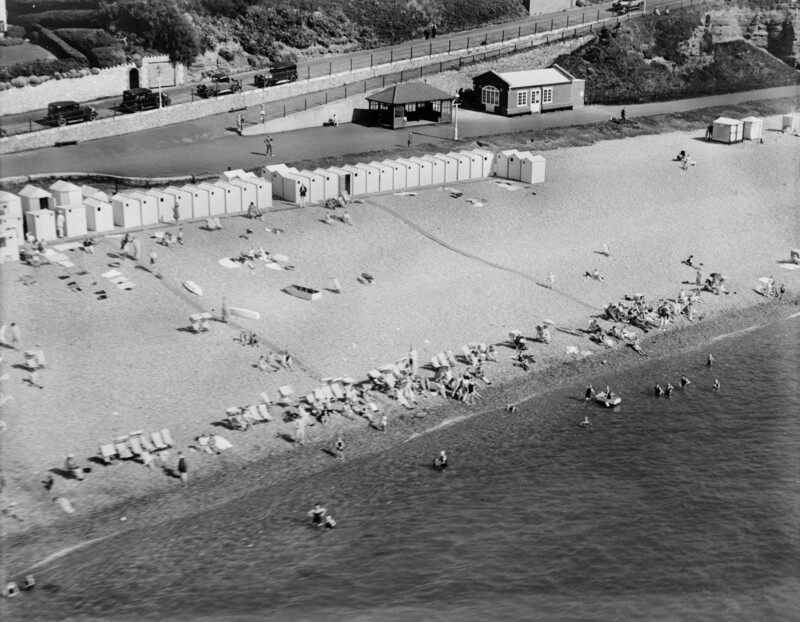 We imagine their excitement, their slight flush of shyness between emerging from the changing room and diving into the pool; we see them, heading down to the beach in droves, swarming on pleasure piers and marveling at the amusements on offer. Why do people still regret the closure of lidos, rendered obsolete by the advent of free bathing? What is it about the image of a pier receding into the horizon that fires the imagination so? Where does such a visceral, often protective response to the skeletal outline of West Pier, of Hastings Pier, of numerous others like them, stem from? Perhaps it’s not the loss of the structures themselves that we lament. Really, it is the irreversible loss of the past we are lamenting, and with it what we perceive as a glamorous, and strangely innocent time in our collective heritage. But the birdsong isn’t lost: look at the Aerofilms images. Zoom right in. The quality is of such high standard, the level of detail so exquisite, you might as well be there. You can almost hear the sea lapping against the sand; you can almost feel the sun on your face and taste the saltiness in the air. See the people splash about on the surf -a snapshot of innocence captured from a rickety aeroplane and preserved forever, rescued from the depths of a receding past by the Britain from Above project.